VOYAGER CONTINUES: RAVEN is now STARSHIP PROMETHEUS…adds new CGI footage! I’ve got some good news for you and I’ve got some bad news. I also have some neutral news, and I’ll start with that. The fan film formerly known as Star Trek: Raven, later known as Voyager Continues: Raven (or was that Raven: Voyager Continues?) will now be known as STARSHIP PROMETHEUS…with its pilot episode being “Raven.” Is that all perfectly unclear? The original RAVEN fan film was released in October of 2016, one of the first fan films to come out after the fan film guidelines were announced a few months earlier (although filming for the production had wrapped prior to the guidelines). 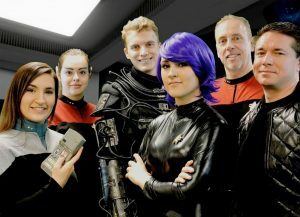 Initially, show-runner DAVID WHITNEY of Starfleet Studios in Iowa was prepared to challenge the guidelines openly by releasing Raven in defiant non-compliance with the new rules. Ultimately, though, he only broke two of the “no-no’s”—the video was 30-minutes long but wasn’t released in two separate 15-minute parts, and the title appeared as Star Trek: Raven (the guidelines sy you can’t use the words “Star Trek” in your fan film title). 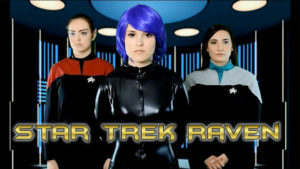 However, the title appeared in the YouTube description as RAVEN: Voyager Continues – A Star Trek Fan Production. So David kinda half-followed the guidelines in that department. In the end, CBS took no action (and probably no notice). After all, this was still the “transition” period just after the guidelines were released, and fan films released at that time seemed to be allowed a bit of leeway. Since then, Raven has generated an impressive 130K views. The cast was a mix of older Star Trek fans who weren’t necessarily actors (including JIM VON DOLTEREN in one of his earliest Trek fan film roles—he would later go on to appear in The Federation Files, Starship Republic, and the upcoming Convergence) plus young fashion models…truly an interesting mix! 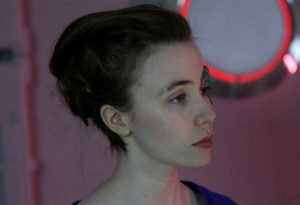 And even though it was called Voyager Continues (in addition to being called Raven), there was only one brief scene buried in the closing credits showing Seven-of-Nine (played by CAT ROBERTS, who has also appeared in multiple fan series including Star Trek Continues, New Voyages (an unreleased episode), The Federation Files, and The Red Shirt Diaries). 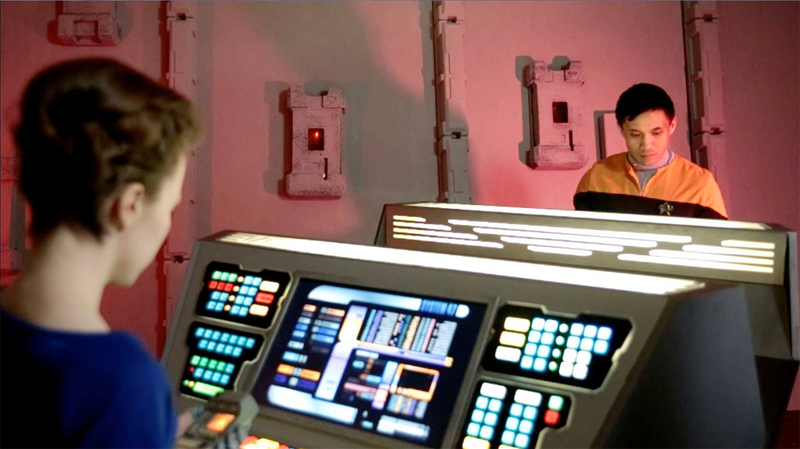 Although the missing starship Voyager was discussed, nearly all of the action in Raven took place in the Alpha Quadrant. Okay, so what’s the good news and what’s the bad news…? 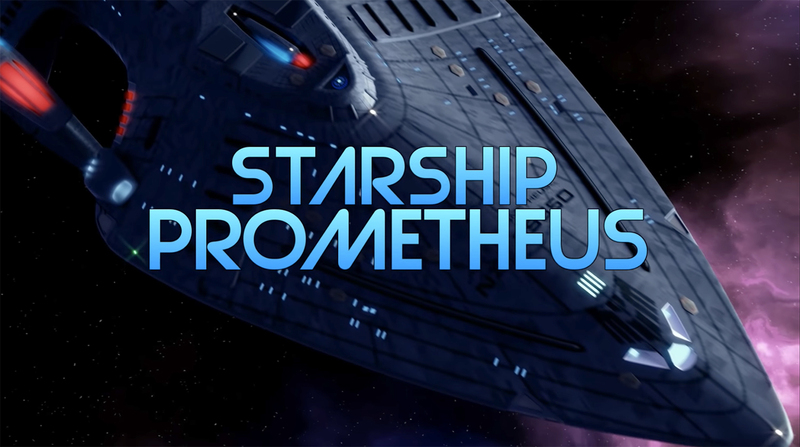 Author Jonathan LanePosted on November 28, 2018 November 29, 2018 Categories Fan Film Features, NewsTags David Whitney, Star Trek Raven, Starfleet Studios, Starship Prometheus, Voyager Continues6 Comments on VOYAGER CONTINUES: RAVEN is now STARSHIP PROMETHEUS…adds new CGI footage! For the last couple of years, if you wanted to see the USS Voyager and its crew in a Star Trek fan film, the place to look has been STARFLEET STUDIOS in Iowa (not to be confused with Starbase Studios; that’s a whole different life form) and show-runner DAVID WHITNEY. 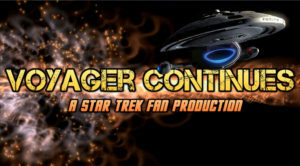 David is an avowed Voyager fan and has already made a name for himself and his production company with a series of Voyager Continues fan films including the half-hour long RAVEN from 2016 and the short fan film DERELICT. The next four episodes of Quick Trek were all released nearly simultaneously at the end of May 2018 and shifted the setting to a Cheers-like bar and even featured the Cheers musical theme during the intro and over the closing credits. This time, the characters were a motley crew made up of Counselor Deanna Troi (played by TAWNYA HOLLY), an unnamed Vulcan (played by JIM VON DOLTEREN of the fan series Starship Republic), along with Harry Mudd and Chakotay (both played by DAVID WHITNEY). The fine folks at STARFLEET STUDIOS in Iowa (not StarBASE Studios in Arkansas) have released a fun little comedy vignette as Kathryn Janeway seeks a critical item, only to be thwarted by…a barista??? VOYAGER CONTINUES releases photos from its “DERELICT” episode shoot! Late last year, STARFLEET STUDIOS (in Iowa) released the half-hour long Star Trek: Raven and, with it, introduced the world to the new VOYAGER CONTINUES fan series. 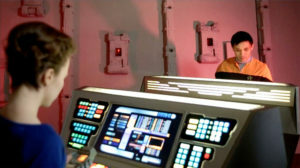 Set aboard the titular starship during its time traversing the Delta Quadrant, the series promises to eventually feature members of the entire USS Voyager crew. 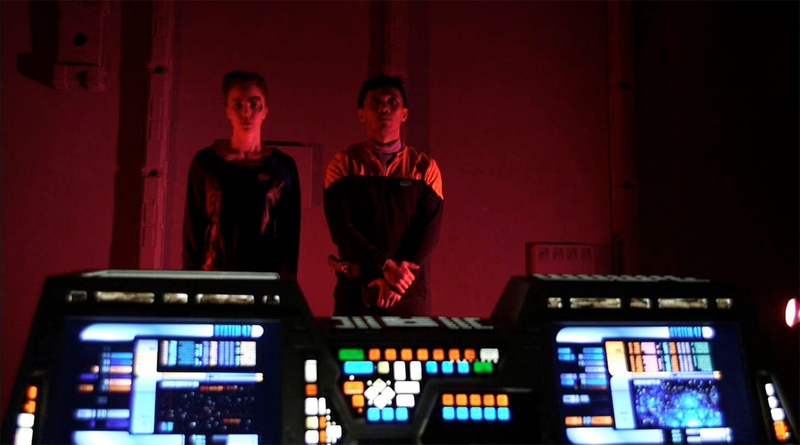 Their first episode, a short film called “Derelict,” will focus on just two characters: Seven-of-Nine and Harry Kim. Last week, show-runner David Whitney began shooting scenes of “Derelict” with real physical sets (unlike the virtual CGI sets composited behind footage of actors in front of green screens). And a few days ago, photos from that shoot were posted. The first thing I noticed was that Seven-of-Nine’s hair was brunette, not blonde like actress Jeri Ryan had worn her hair when she played the character on Star Trek: Voyager. Knowing that David Whitney had not been averse to using wigs (as his lead actress in Raven had filmed all of her scenes wearing a purple wig), I asked David why he hadn’t done the same thing for Seven-of-Nine? It would have looked lame. I know people will complain. I don’t care. Seriously, a wig would have looked crazy. Of course Raven’s wig was awesome. Finding the actress with blue eyes was hard enough. Frankly, finding someone who could act, was pretty, and had the right kind of bone structure was a real find. Brown hair? No big deal. Jeri Ryan is a brunette. She dyes her hair. No, I could just not bring myself to ask her to bleach her hair. I’m really happy with her. What a nice lady. You can see more photos from the shoot and follow the latest news for this new fan series on the Voyager Continues Facebook page. Author Jonathan LanePosted on January 24, 2017 Categories NewsTags David Whitney, Starfleet Studios, Voyager Continues8 Comments on VOYAGER CONTINUES releases photos from its “DERELICT” episode shoot! 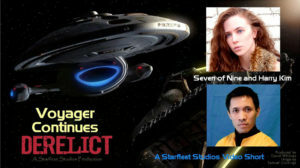 STARFLEET STUDIOS releases VOYAGER CONTINUES “DERELICT” trailer! Is it really Janeway? When I first watched the new trailer for the upcoming episode “Derelict” of VOYAGER CONTINUES from Starfleet Studios (the one in Iowa that just released the fan film Raven), I wasn’t sure. Then I got my answer at the end of the 45-second video. It turns out that the voice is just a really good impersonation of Kate Mulgrew done by an actor named Liam Howarth-Mulgrew. And no, that name isn’t just a coincidence. I found out from show-runner David Whitney that Liam is just a huge fan and legally changed his name. Unfortunately, Liam doesn’t actually look like Kate Mulgrew, so we probably won’t be seeing Captain Janeway on “Derelict” (although I suppose there’s always lip syncing). Liam had previously voiced Janeway on the audio drama series Star Trek: Voyager – The Lost Episodes in a two-part episode called “Ghosts.” You can listen to “Ghosts” Part 1 and Part 2 and hear Liam’s amazing rendition of Kate Mulgrew’s unmistakable voice. Author Jonathan LanePosted on December 29, 2016 Categories NewsTags David Whitney, Starfleet Studios, Voyager Continues4 Comments on STARFLEET STUDIOS releases VOYAGER CONTINUES “DERELICT” trailer! 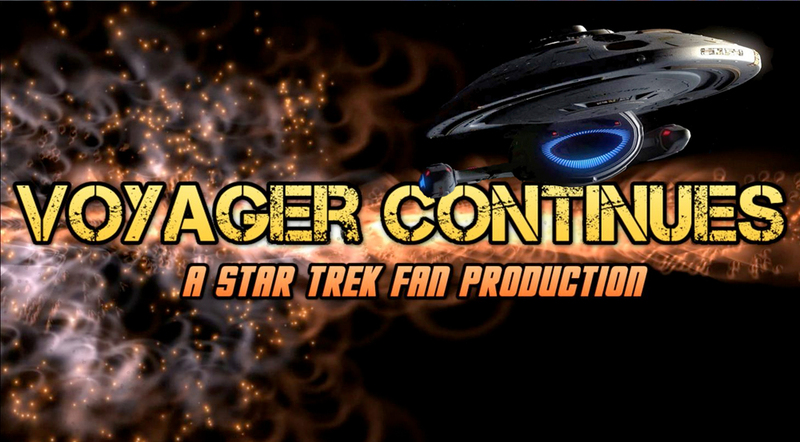 STARFLEET STUDIOS cancels THE TNG PROJECT but revs up for VOYAGER CONTINUES! 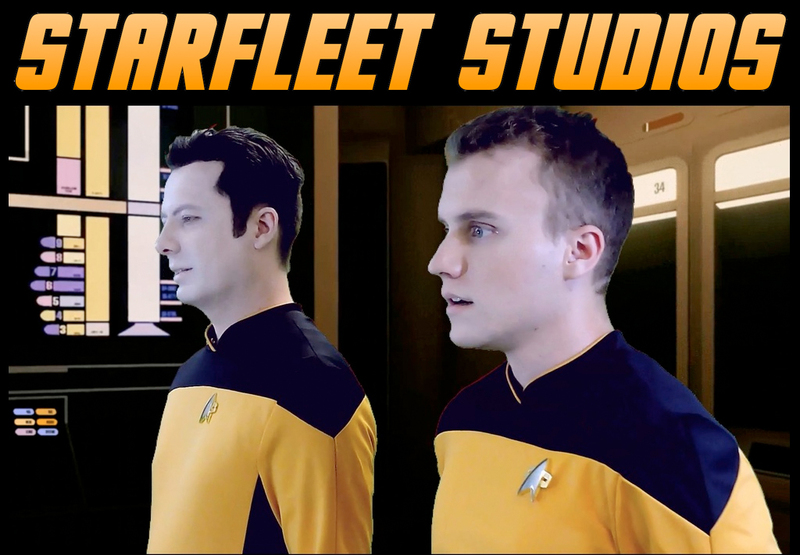 There’s some bad news and some good news for STARFLEET STUDIOS (based in Iowa–not to be confused with STARBASE STUDIOS, which is moving from Oklahoma City to Arkansas…more on that in an upcoming blog). The bad news has to do with their planned new fan film, THE TNG PROJECT (working title), which launched a Kickstarter in late October attempting to raise $11,000. Frankly I did not expect the TNG project to succeed. I did not do a great job for the videos. I had no cast interviews, and did not groom the fans. 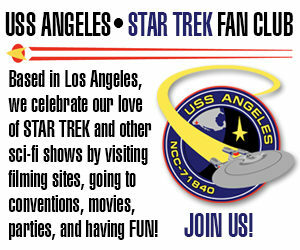 But I wanted to give TNG fans something. One of the reasons for the lackluster effort came because, during the Kickstarter campaign, the main actor for the project, who was set to play Data, became unavailable as his acting career has begun to take off. So rather than pushing hard for donations for a project that was now lacking a main character, David Whitney simply let the campaign close, unfunded. 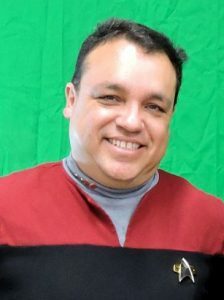 Author Jonathan LanePosted on December 3, 2016 December 6, 2016 Categories NewsTags David Whitney, His Name Is Mudd, Starfleet Studios, The TNG Project, Voyager Continues3 Comments on STARFLEET STUDIOS cancels THE TNG PROJECT but revs up for VOYAGER CONTINUES! STARFLEET STUDIOS releases RAVEN and launches NEW KICKSTARTER campaign! The episode features quality compositing of well-lit actors in front of green screens with high-end 3D backgrounds and lots of music that’s very non-traditional for Star Trek…so Raven has a very refreshing and well-produced feel. The episode ends on a bit of an open-ended cliffhanger, and so there’s room for another episode…if David Whitney wants to make it. In the meantime, David and Starfleet Studios are already moving ahead with plans for a third original production titled (for right now) The TNG Project. With the latest two Starfleet Studios releases still “hot” and spreading virally though the fan film world, David has launched a brand new Kickstarter with a goal of $11,000. The new fan film has cast an amazing Data look-a-like, and the production will feature a cutting-edge 3D compositing technique that will let live actors move through a virtual starship “set” that will pivot, pan, and zoom to match the actors’ movements. 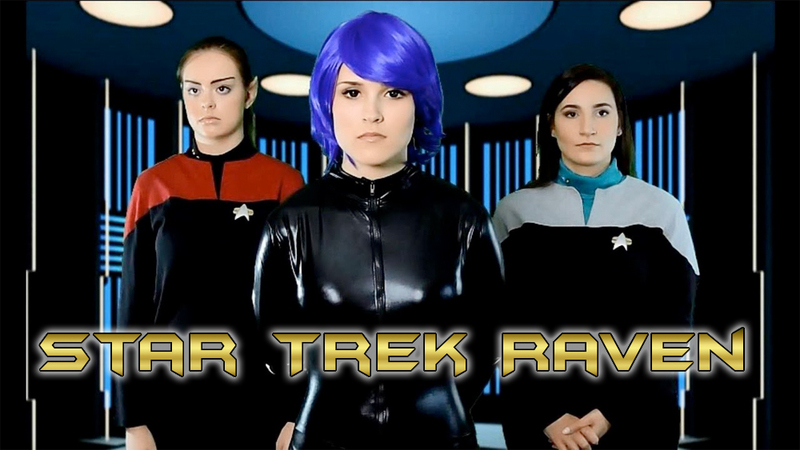 Author Jonathan LanePosted on November 2, 2016 April 17, 2017 Categories NewsTags David Whitney, Star Trek Raven, Starfleet Studios, The TNG Project2 Comments on STARFLEET STUDIOS releases RAVEN and launches NEW KICKSTARTER campaign!